ITC is an Apple Authorized Service Provider. We can perform all in-warranty repairs on your Macs, iPads, iPods and iPhones. There is no appointment necessary, come in when you need us most. As all repairs are authorized by Apple, your warranty stays intact. Need your Mac repaired but cannot make it into our store for service? We have you covered! ITC Offers free home or office pickup & delivery for service repairs within a 10-mile radius of our store. If your Mac product is out-of-warranty, our Apple Certified Technicians will diagnose your issue and your unit will be repaired in a timely manner using Genuine Apple parts. All parts & labor are covered by ITC's 90-day warranty policy. Battery life running low? Mac experiencing constant spinning beachballs? iMac stuck at Grey Screen? We will replace your old hard drive with a modern SSD and offer battrery replacement for all macs. Data recovery Services using DeepSpar hardware . For more advanced recovery, we work with the industry leader DriveSavers. Thank you! 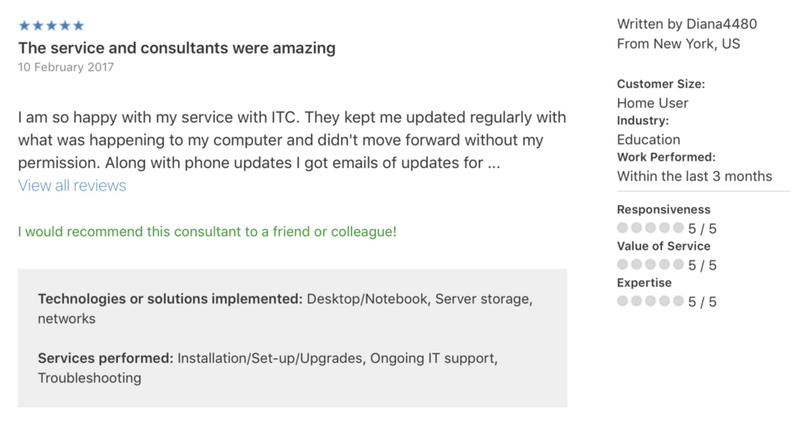 ITC will always work very hard and try our best to always do the right thing and take care of you. We appreciate the opportunity to try to help.